The School History Room was the brainchild of AVM (Retd) Raja Aftab Iqbal who thought of preserving the glorious past of the School and highlighting the achievements of old and young Sargodhians. On 12 November, 1998, Sqn Ldr M Shahid Hafeez was appointed the Officer Incharge School History Project. He was assigned to compile the history of the School in association with Stenographer (Retd) Abdul Rashid, the first Pakistani employed at the School in 1953. Additionally, he was assigned to oversee the necessary renovation to build a History Room in the Hobbies Club. Two rooms were merged to create space, and show cases were built in the walls to display the assets. Old magazines and Newsletters of Royal Pakistan Air Force Public School times were brought in. Some shields and trophies including Chigwell Shield were also added to the Room. Besides, briefs of Commandants and Principals of the School, and some "Historical Firsts" were collected and engraved on steel plates to decorate the walls of History Room. To further enrich the Room, letters were written to the concerned agencies, and retired and serving personnel of armed forces and civil service. Many of them responded positively and resultantly a lot of information was gathered. In this connection Sqn Ldr Shahid was also sent to attend Platinum Jubilee Celebrations of Military College, Jhelum (MCJ) from 19 to 20 November, 2000. The visit of MCJ Museum was made part of the celebrations. On his return from MCJ Sqn Ldr Shahid brought home some new ideas for displaying the historical assets. He suggested that the History Room may be expanded and divided into galleries for displaying various eras of the School on the pattern of MCJ Museum. The first major contribution to the History Room came from the then Chairman Joint Chiefs of Staff Committee Air Chief Marshal Farooq Feroze Khan (69-Fury). He sent his working uniform and loads of mementos and souvenirs which were presented to him by services and organizations inland and outside the country. He also sent his signed photograph in uniform for the History Room. Things kept pouring in and soon the History Room was packed to the capacity. Hence, it was decided that the History Room should be shifted to the Academic Block and expanded to accomodate ever increasing assets. Meanwhile Change of Command took place and Air Cdre (Retd) Abdul Qadir Sargaana took over as Principal in November, 2001. The decision of shifting and expanding the History Room was held in abeyance. On 16 June, 2004, Sqn Ldr Shahid handed over the School History Room to Flight Lieutenant (now Squadron Leader) Sabahat Batool. It goes to her credit that she got the venue of History Room changed from Hobbies Club to the Academic Block. The Old Mathematics Lab was transformed with beautiful layout of glass showcases to serve the purpose. All important documents and memorable items of prominent Sargodhians were shifted. Now visit of the School History Room by dignitaries was a made a regular feature. During the tenure of Air Cdre (Retd) Tayyab Naeem Akhtar, the School History Room was further expanded by merging the old Biology Lab and adjacent room. 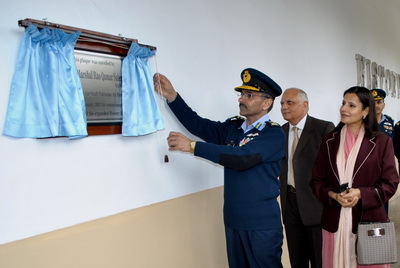 On Parents' Day held on 19 February, 2011, the expanded History Room was inaugurated by Chief of the Air Staff, Air Chief Marshal Rao Qamar Suleman. In the recent years some unique souvenirs have been added to the Room like uniforms of former Chief of the Air Staff Air Chief Marshal Kaleem Saadat (697-Fury), Chairman Joint Chiefs of Staff Committee General Ehsan-ul-Haq (589-Fury) and IG Police, Bangladesh; Commemorative sword presented by General Ehsan and a dagger presented by the former Vice Chief of Army Staff General Ahsan Salim Hyat (447-Sabre) are also showcased there. Arun Prakash, the celebrated writer from India during his second visit to the School presented his coffee table book "Hugh Catchpole of the Subcontinent". The accompanying Commandant, Rashtria Indian Military College, Dehradun, Colonel Prem Parkash presented his College Crest to the School. All these souvenirs are on display in the History Room.